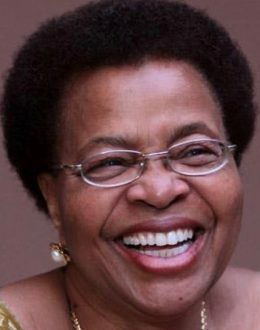 Graça Machel DBE is a Mozambican politician and humanitarian. She is the third wife of former South African president Nelson Mandela and the widow of Mozambican president Samora Machel. Graça Machel is the only person in history to have been first lady of two different African countries, serving as the First Lady of Mozambique from 1975 to 1986 and the First Lady of South Africa from 1998 to 1999. She is an international advocate for women’s and children’s rights and in 2007 Graça Machel was made an honorary Dame Commander of the Order of the British Empire at the request of British Prime Minister Gordon Brown. She has been a social and political activist for many decades. She was a president of the Foundation for Community Development (FDC), a Mozambican not for profit organisation she founded in 1994. FDC makes grants to civil society organisations to strengthen communities, facilitate social and economic justice, and assist in the reconstruction and development of postwar Mozambique. In 1994, the Secretary General of the United Nations appointed Ms Machel as an independent expert to carry out an assessment of the impact of armed conflict on children. Her groundbreaking report, presented in 1996, established a new agenda for the comprehensive protection of children caught up in war, changing the policy and practice of governments, UN agencies, and international and national civil society. Graça Machel has been particularly involved in The Elders’ work on child marriage, including the founding of Girls Not Brides: The Global Partnership to End Child Marriage. Machel currently serves as the chair of The Partnership for Maternal, Newborn & Child Health (PMNCH). She also serves as the chair of the Association of European Parliamentarians with Africa (AWEPA) Eminent Advisory Board. Over the years, Ms Machel has gained international recognition for her achievements. Her many awards include the Laureate of Africa Prize for Leadership for the Sustainable End of Hunger from the Hunger Project in 1992 and the Nansen Medal in recognition of her contribution to the welfare of refugee children in 1995. She has also received the Inter Press Service’s International Achievement Award for her work on behalf of children internationally, the Africare Distinguished Humanitarian Service Award and the North-South Prize of the Council of Europe. Among her many current commitments, Ms Machel is Chancellor of the University of Cape Town, a founding member of The Elders, a member of the High Level Taskforce on Innovative International Financing for Health Systems and a panel member of the African Peer Review Mechanism.